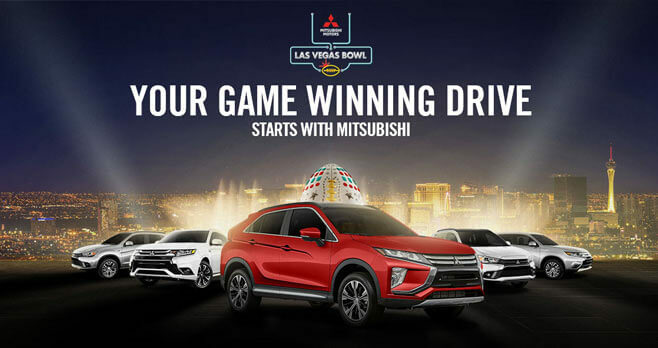 Enter the Your Game Winning Drive Starts With Mitsubishi Sweepstakes for your chance to drive home an all-new 2019 Mitsubishi Eclipse Cross or the ultimate tailgate at the Mitsubishi Motors Las Vegas Bowl. The Your Game Winning Drive Starts With Mitsubishi Sweepstakes is open to legal residents of the 50 United States (including the District of Columbia) Age 21 and older at time of entry. The Sweepstakes begins on October 11, 2018 and ends at 11:59:59 PM PT on November 26, 2018. Limit of one Sweepstakes entry per person/per email address for registering for the Sweepstakes online. The grand prize consists of a 2019 Mitsubishi Eclipse Cross. Visit www.mitsubishicars.com/Your-Game-Winning-Drive to enter and see Official Rules for details.